Nine London clubs have played in the Premier League. Three of them have been ever-present: Arsenal, Chelsea and Tottenham. Two of them are vying for the right to be all-time Premier League kings of London and they meet this weekend when Chelsea host Arsenal. 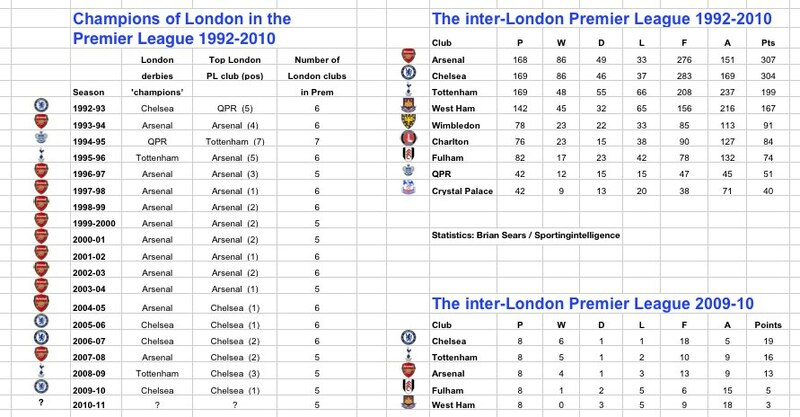 Before that match kicks off, Arsenal have 307 points from London derbies in Premier League history, and Chelsea have 304 (see inter-London Premier League 1992-2010 below). Victory for Chelsea at Stamford Bridge will bring them level on points; victory or a draw for Arsenal will hold the blue tide at bay for a while longer. In the 36 Premier League games so far played just between Chelsea and Arsenal, Arsenal have won 59 points and Chelsea 36. Of the nine London clubs who have played in the Premier League, five are part of it this season and all five of them will play in London this weekend: Chelsea host Arsenal on Sunday, West Ham host Fulham in the other capital derby, on Saturday, and Tottenham host Aston Villa. In the 14 Premier League games between West Ham and Fulham to date, the Hammers lead 28-10 on points. (For the record, two other London derbies happen in lower divisions, with Crystal Palace v QPR in the Championship, and Brentford v Charlton in League One). It will be West Ham’s third London derby of the season. They lost 1-3 at Stamford Bridge earlier in September but last week’s 1-0 yictory over Tottenham ended a run of 12 derby games for the Hammers without a win. Their previous win had been 3-1 at home to Fulham on 18 January 2009. Note West Ham came bottom of the inter-London league last season (see table below), while Chelsea topped that table with six wins, a draw and a defeat from eight games. For eight seasons from 1996-97 to 2003-04 Arsenal were the undisputed champions of London football. Not only did they finish higher than all other London clubs each season in the Premier League as a whole but they were the champions when it came to the London derby games. Then it all changed and for the last six seasons Chelsea have been the London club finishing highest in the Premier League but in only three of those seasons have they come top of the London derbies league. Three years ago that prize went again to Arsenal and two years ago, in a close contest between all five clubs, Tottenham edged it by a point. Last season, Chelsea were three points clear of Tottenham in second place, providing a vital ingredient of their one-point clearance over Manchester United in the Premier League as a whole.